A not very well appreciated attribute of ace(...,type="discrete") is that the scaled likelihoods returned in the matrix $lik.anc are the scaled conditional likelihoods from the "pruning" algorithm of Felsenstein (1981), and not the joint or marginal reconstructions - which we should generally prefer for ancestral state estimation. This was pointed out to me a couple of years ago by Rich Fitzjohn. It is not stated in the documentation for ace that this is the case, but it is implied in Paradis' new book - if a little obtusely. Specifically, on p. 254 Paradis says "if the option CI=TRUE is used, then the likelihood of each ancestral state is returned for each node in a matrix called lik.anc. They are computed with a formula similar to (5.9)....". If we go to formula (5.9) on p. 147, we see that it is the formula for the conditional likelihood of the subtree from the pruning algorithm. One trivial way to "demonstrate" (and I use this term loosely) that this is the case is by simulating & then analyzing trees with branches of zero length. This is because nodes separated by a branch of zero length will have identical joint/marginal reconstructions - but they may have different conditional reconstructions from the pruning algorithm because these scaled likelihoods consider only the subtree descended from the node. Much better. 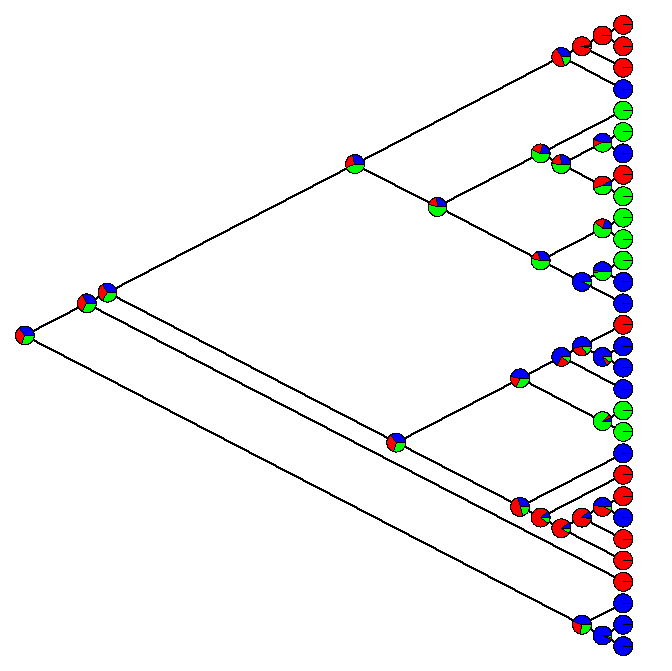 Now nodes separated by branches of zero length have the same probabilities - which they must as no evolution could occur on said branches. Let me note that this is not intended to be a criticism of ace(...,type="discrete") - I just think that it may not be doing what many people think it is doing and this should be of concern. 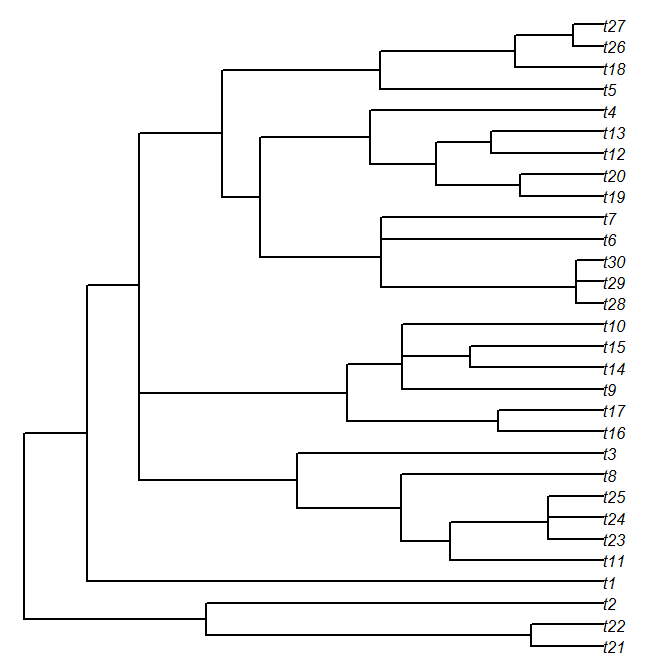 Marginal & joint reconstruction is evidently possible in diversitree. I should also say that after thinking about this some more, the method above based on stochastic mapping gives the marginal probabilities for the ancestral states based on a joint sampling procedure. (This is also stated about SIMMAP, here.) These seem like they will be very close to the marginal probabilities, but perhaps not exactly the same. Slightly different angle as normally you optimize with optim.pml the tree and keep the rates fixed/scaled. PS: I always found it a bit problematic that functions like sim.history seem not to scale the rate matrix. For DNA there is a kind of convention to set the transition G->T to one as you can easily compare different rate matrices. Internally Q is scaled differently see e.g. formula (13.14) p. 205 in Felsensteins "Inferring phylogenies". So it is still possible that users mess around with the edge length of the tree. Thanks Klaus. This works quite well. I suppose I should have realized that this could be done with phangorn! 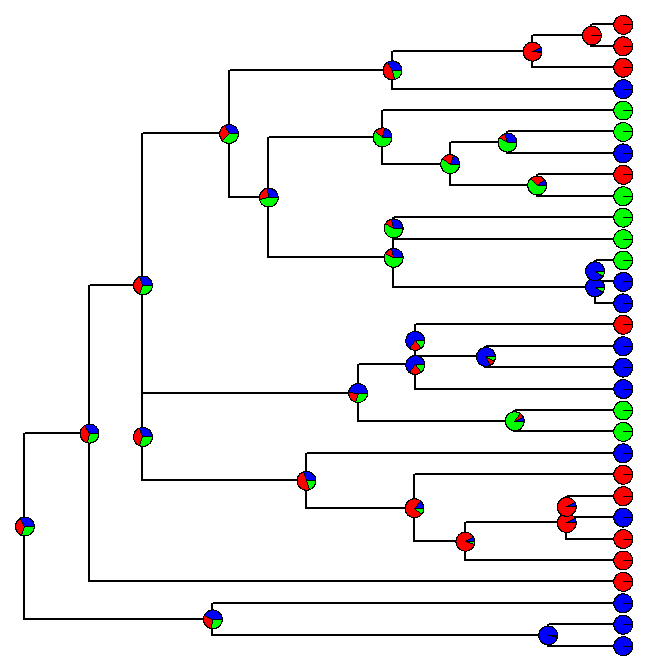 Yes, in tree inference, the branch lengths are not fixed so we need to fix (or scale) Q. In comparative inference, the branch lengths are fixed (because the tree is already estimated) and may be in units of time, so we do not need to scale Q. When we estimate Q this puts it on the scale of the branch lengths of the input tree.